Kilmarnock moved a huge step closer to safety in the Ladbrokes Premiership after a comfortable 2-0 win over Hamilton. Conor Sammon broke the deadlock for the visitors from a well-worked corner before Jordan Jones added a second to put the Rugby Park men in a commanding position. 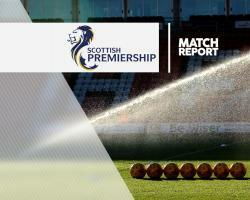 Accies were twice denied by two impressive saves from goalkeeper Freddie Woodman and spirited defending as they slipped further into trouble in the battle to avoid the drop. Kilmarnock moved up to seventh and have all but secured their Premiership status for another season, moving six points ahead of the relegation play-off spot. But Accies dropped to 10th, level on points with Motherwell one place below them. Killie had not lost at the SuperSeal Stadium in seven years and that record barely looked under threat here. Goalkeeper Woodman was alert early on, pushing Dougie Imrie's curling effort on to the post. However, after Sammon headed over moments later at the other end, the visitors opened the scoring through the on-loan Hearts striker after 11 minutes. Stevie Smith's scuffed shot from Jones' short corner was blocked on the line but Sammon, who was one of two changes for Killie, forced it home for his fourth goal of the season. Lee McCulloch's side stamped their authority on the match, doubling their lead after 23 minutes. Luke Hendrie's long throw into the box was flicked on by Kris Boyd and Jones swept the ball past Remi Matthews in goal. Accies searched for a foothold in the game but were denied again by Woodman. Imrie's glancing header from Scott McMann's terrific cross looked to be creeping in at the far post but the Killie shot-stopper saved low to his left. Martin Canning made a couple of early changes after the interval for Accies as Danny Redmond replaced Ali Crawford and Imrie made way for Louis Longridge. Killie seemed content to sit deep, soak up the pressure and pick Hamilton off on the break. They were protesting for a penalty when Jones tumbled in the box under pressure from Georgios Sarris but referee Willie Collum waved away appeals. Canning's last throw of the dice was to sacrifice Blair Adams for Eamonn Brophy after 70 minutes but they found Killie's resistance too difficult to breach as Accies poor form against the Ayrshire men continued.